joy is a funny thing. sometimes it bubbles right up out of the smallest crack of earth to surprise me when I’m distractedly searching for my next suffering step. joy surprised me in just such a way this weekend and I am beyond thrilled. God doesn’t have to surprise us. Yet, somehow I imagine He sits, enthroned in glory with angels bursting beautiful harmonies, positively giddy (in a majestic sort of way) at the idea of surprising His children with joy. We may be down here, trudging through hardships and trials… but amidst and underneath all of the regular rubble, a steadfast stream just gurgles up with inexpressible joy. Mmmm. How perfectly thoughtful of our Lord to meet that subtle need (that escapes explanation and then makes me crazy searching for what I’m “missing“) in the form of joy. C.S. Lewis wrote a book about his life, “Surprised by Joy.” Given my unwavering appreciation for that man, I know this inexpressible joy has touched others as deeply (and who are able to articulate it more aptly than I). So, all this abstract talk has surely been a surprise to you, since I’ve been straining to get any information at all up here lately. Well, don’t go expecting any similar bursts of inspiration … today may not be habit forming (unfortunately, I generally can not control surprises). 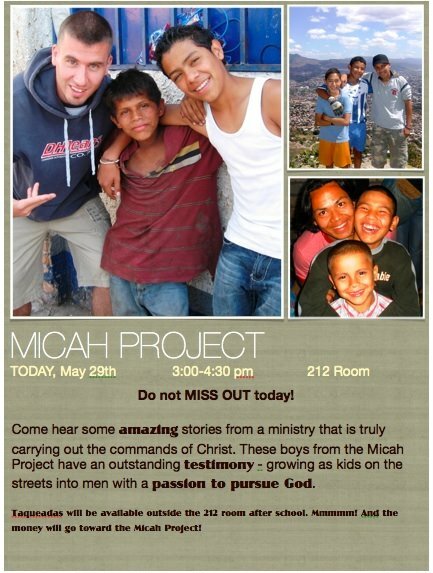 I would, however, like to share how God blessed me with joy in the form of Micah Project. 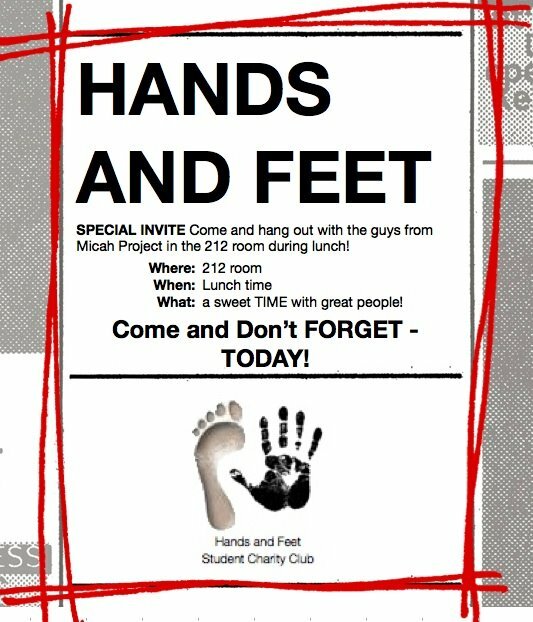 (A little background) We’ve been trying to get a service group going at the school called “Hands and Feet.” Throughout this year, we’ve held bake sales, donation drives, awareness campaigns, and ventured out on a few field trips. After a series of random events strung together perfectly, yesterday we invited the Micah Project to give an after-school assembly. Not being at all confident in our students’ interest in anything not including personal gain, I presented the idea to our teachers that they might offer extra credit for students who attended and completed an assignment. I’m not sure if it was the extra credit or the praise and worship that followed, but the room was packed out! We arranged for a taqueadas (tacos/gringas combos) vendor to sell after school to raise money for the Micah Project and then everyone crammed in to listen to the story of this young organization, whose purpose is to rescue boys off the streets of Tegucigalpa and then provide discipleship training and education. The director, Michael Miller came, along with Becca (operations director), and three of the boys from the program (Kristopher, Wilmer, and Michael). Though I still struggle with mission-envy (a new term I’ve given to being jealous of those involved in other missions), I can see that God has a very sure role for me here. Before I came, I saw an opportunity to connect the students who can make a difference with those who need the difference made here in Honduras. I just felt the biggest, blessed confirmation that the Lord will be faithful to complete that work in this school. Many, many things are changing next year – more than I can explain pushing these keys. I do know, however, that God is the same. He is just as faithful, just as perfect, and just as concerned with the lives of His children today as He was yesterday. Praise God for joyful surprises! I will write more soon, but I have found a car to purchse for next year. If you have not read in previous posts or my newsletters, I have been looking for a car to expand my outreach next year. Though I feel perfectly comfortable and safe traveling around on my own with public transportation, it limits my ability to meet up with students (public transportation is too dangerous for them). A car would allow me to set up times to meet girls for discipleship and pick up students for different events when they do not have a ride. I am also looking forward to increasing my involvement in outside ministries (and getting the students involved as well!). So, having said that, I am planning to pay for a portion of the car and raise money for the rest. I know the current owner (she’s a good friend) and my plan would be to bless a missionary with the car whenever I decide to leave Honduras. I am still praying about everything, but if you are feeling led right now to support this next step in ministry, please let me know. This entry was posted in anecdotes, Causes, Thoughts. Previous Post Previous post: wow.